Whenever I can see football season coming to a close, I always get this pit of doom feeling in my stomach that leaves a lingering questioning of "what will accompany me on my Sundays while working now?" So once again the sports stars are glistening in my favor for this New Years weekend, to offer not only the Superbowl, but an epic UFC126 card. 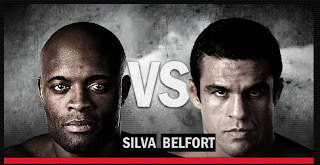 Like a lot of the world, I have been awaiting this fight between Anderson Silva and Vitor Belfort for quite sometime. In Silva's last fight, many of us were left amazed that Chael Sonnen was able to jarr Silva's near perfect accuracy and defense, only to find the dude was roided up. Since the card line up was announced, whenever a friend/reader would ask me on my thoughts on Vitor, I would say "if you were to take a beast of a man, take off his human arms and attach morning-stars, that would be Vitor." He's explosive and such a heavy hitter, I think if his conditioning is up to game and he can get inside Silva's pocket to exchange, he has a great chance. Words can't express my angst for this fight, in fact it pains me a bit to see Forrest Griffin and Rich Franklin face off. I truly respect and adore both fighters, both in person are incredibly humble and charming and in the ring I can appreciate each of their styles. 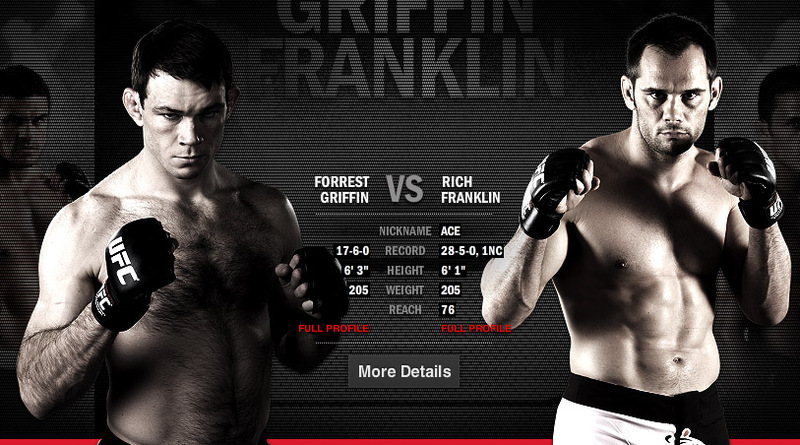 Forrest is a brawler and Rich an incredibly calculative and smart fighter. How Franklin was able to pull that win over Chuck Liddell w/ a broken arm is amazing to me. So although this fight is like like brother vs brother, it's going to be one of those edge of your seat type fights. 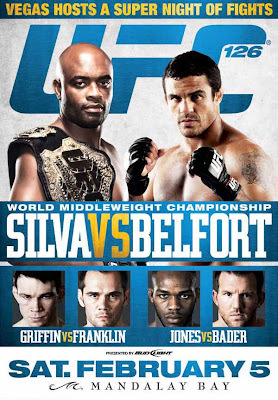 As if the Silva / Belfort and Griffin/Franklin fight wasn't huge enough, this fight card is packed with great match ups throughout varying weight classes and up and coming fighters. I'm definitely looking forward and routing for Jon Bones Jones in his fight vs Ryan Bader, he's such an incredible athlete and really thinks on his feet to adjust game play during fights. When WEC was announced to be merging with it's bigger brother the UFC, MMA fans of the world said hoorah and strictly UFC fans said "WTF." It blows my mind when "fight fans" think that MMA is only UFC. I was stoked about this because the WEC has a collection of great fighters and lighter weights always provide explosive entertaining fights. 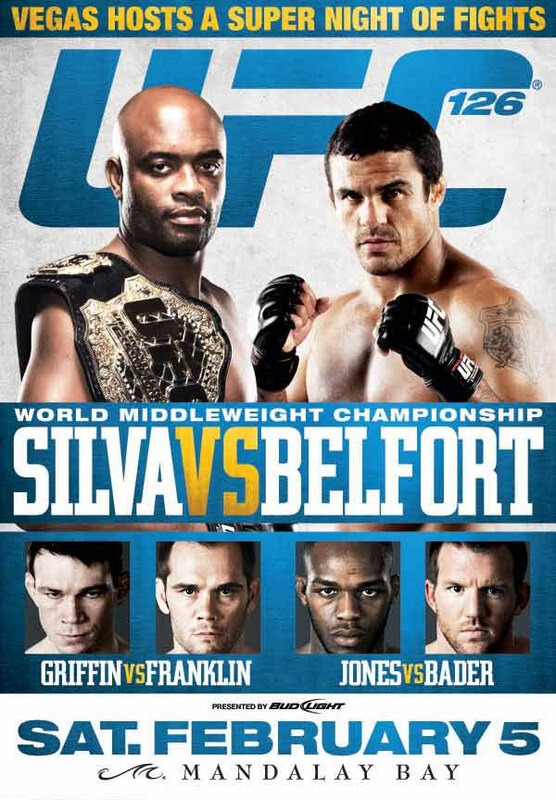 We all know that sometimes the best fights don't necessarily happen in the main event, but also in the undercard. With that said I'm routing for Yamamoto and stoked to see bot he and Johnson fighting. 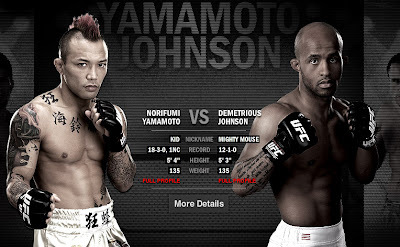 Yamamoto who stands at 5'4" (my height" and Johnson at 5'3", they are two of the shortest fighters in MMA and in any sport I love to see athletes go beyond stats and height. Also why I love Darren Sproles (RB Chargers0 for the longest time he was the shortest player in the NFL. So with that, let the epic and much needed sports weekend begin! 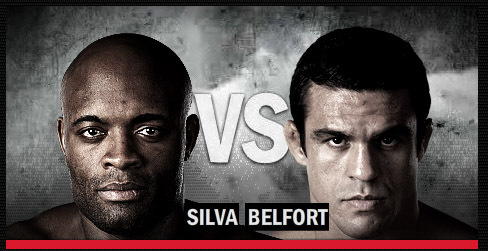 Silva/Belfort - Sigh..... not gonna jinx it by picking but I SO WANT Vitor to win.